juni 2004 | 238 blz. 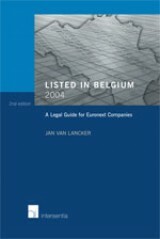 Belgian law applicable to listed companies has undergone numerous significant changes. A key obstacle for legal practitioners is, however, the accessibility of this new legislation. This Guide untangles the mass of legal rules.